Traveling the world sounds wonderful until you remember that whole "it costs a lot of money" thing. But here's your chance to travel for weeks completely FREE in exchange for nothing but your snap stories. 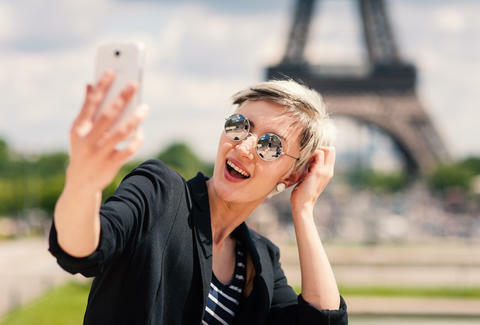 WOW air, Iceland's low-cost airline that sells $99 flights from the US to Europe, just started the SnapTraveler program, which offers four inventive Snapchatters all expenses-paid travel excursions. Each SnapTraveler will get four free trips over the course of three summer months to four of WOW's 28 worldwide destination. One of those trips has to be to Iceland, but the other three destinations can be to places like Amsterdam, Barcelona, and Rome. Each trip is expected to last 3 - 8 days. All you have to do in return is share your adventures on WOW air's Snapchat account and a few other social media channels. That's it. Seriously. And when Wow says "all expenses," it really means "all expenses," as the airline is ponying up for flights, hotels, activities, and even a travel allowance. To fill the dream position, the airline is looking for someone, "creative, ambitious and fun with a passion for travel, good Snapchat storytelling abilities and of course, the WOW factor." That last part is pretty cheesy, but don't tell WOW that if you want the job. OK, so how do you apply? Just upload a creative, two minutes-max snap story here before the May 8, 2016 deadline. WOW promises to let the selected applicants know they've been chosen via social media on May 17, 2016. As long as you're at least 18 years of age and an English speaker, you're eligible to apply. But, you do need to be able to fly out of one of WOW's 28 hubs. If you don't live by one of these airports, you can still apply. You'll just need to get to one of these airports at your own expense once it's time to start your travels. For more information, you can check out the full terms and conditions here. If you haven't applied yet, there's something deeply wrong with you. Kara King is a News Writer at Thrillist and still hasn't figured out Snapchat. Send news tips to news@thrillist.com and follow her at @karatillie.